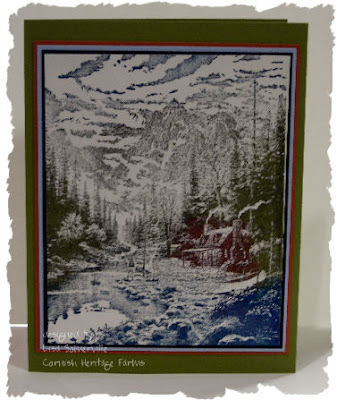 Looking for a quick and easy way to color those beautiful Thomas Kinkade images from Cornish Heritage Farms? Grab some Palette Ink Cubes and pounce them over your image then stamp on glossy card stock. Wow, very pretty. I purchased three of the TK stamps from Cornish Heritage and really must try to do something with them. My mom loves his work and I bought them to make her some note cards. You have shown several ways to ink them up, I'll have to just give it a try!!! Thanks for the ideas. WOW, great tip! That really takes the pressure off of trying to paint one of these stamps. Beautifully done Lisa!